Evotek Sym design emphasizes consistently the thought that inspired the whole project. 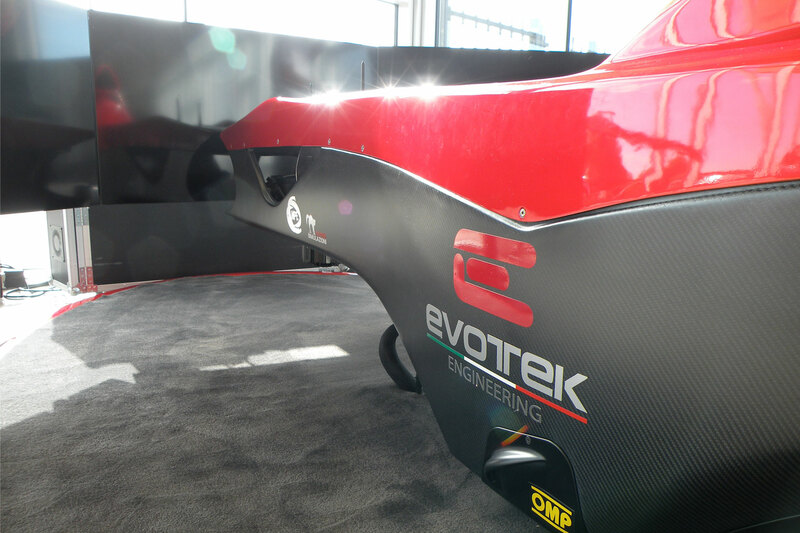 Shapes and sizes are essential: Evotek Sym has been designed in an original and extreme way with the ambition to become a reference for the new generation of simulators dedicated to Formula 1. Evotek Sym Club Edition’s design is a result of technical-functional requirements and a tribute to the ideas and people that have shaped the history of F1. 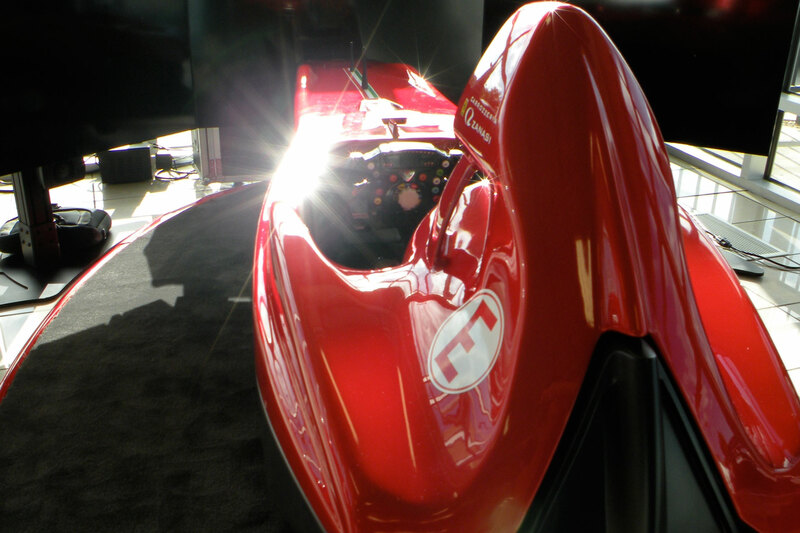 Evotek Sym’s front retrieve Ferrari 156 by Von Trips, while the rear part of the frame is instead a clear tribute to Colin Chapman (founder of Lotus) which has revolutionized the forms of F1 with the introduction of the ground effect (Lotus 79). The design of the rear frame represents the “ideal section”, the form that every F1 designer wants to achieve. Furthermore the structural rigidity of the simulator’s frame is mainly ensured by this triangular geometric shape, rather than by sophisticated structural calculations. 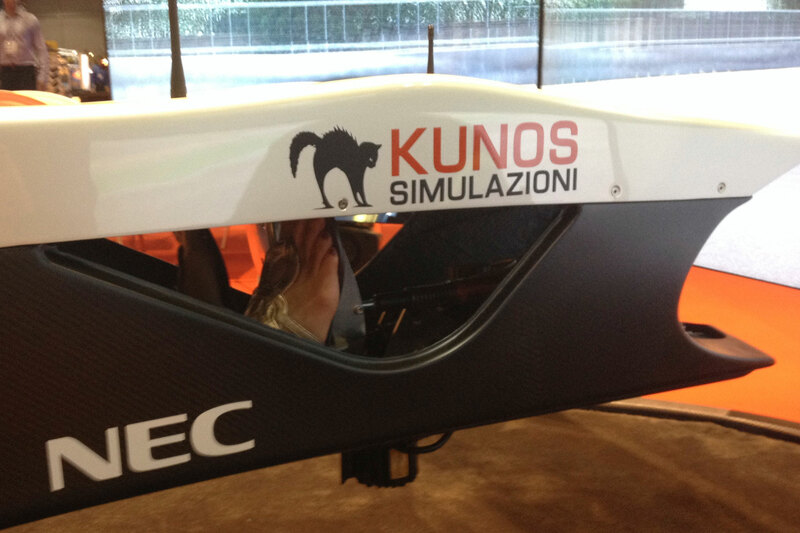 The open sides on the front of the body allow you to check the correct use of the pedals, they have been specifically requested from CIS Vallelunga driving instructors. The cockpit has also various details that recall Adrian Newey’s cars and other new designers from F1. The division of the body points out clearly the different functions of the top “aesthetic” and the lower “technological”. Over the time, these two parts have become a special need for the assembly of numerous devices for augmented reality. Steering wheel and cover are the only visible parts of the car while driving, for this reason they are very important not only for aesthetical reasons, but especially for a total involvement of the driver. The compliance with the regulatory constraints and the correct riding posture give the passenger the same view that the pilot has in reality. The driving position ergonomics is the result of a careful technical study: if from the outside the simulator shows futuristic and attractive lines, when you drive it you can fully appreciate the driver’s view and have access to all the devices and details that blend very naturally the real world into the virtual. In other words, design is the coherent result that makes stands out at the first glance Evotek Sym from any other simulator. Evotek Sym has its own specific identity and a highly technological mission. Evotek Sym is a tribute to all those who have made Formula 1 a great sport.